Kate has been selling and receiving commission work for her art for over 15 years. For the past 2 years she has been working full time and now has a studio in Barwick in Elmet, Leeds. Born in Leeds, West Yorkshire in 1979 she has studied at Bradford College and Leeds University, but most of her skills have been self taught providing her an individual unique style. Her work has been sold all over the world, from Europe, United States, Australia, Canada and many other countries. Born in West Yorkshire in 1979 she has studied at Bradford College and Leeds University, but most of her skills have been self taught providing her an individual unique style. Kate specialises in designing and creating paintings for her clients. 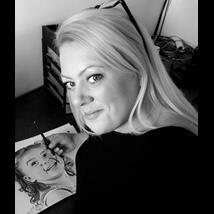 With an ability to utilise her skills in creating pieces of art that suit her clients needs. Shes enjoys working with with her clients and adapting her painting style technique ensuring the art she creates is perfect for their requirements. Kate's passion and expertise are reflected in her broad range of work, from contemporary landscapes, floral and abstract paintings to drawing portraits and figurative work. Her work can be found in offices, restaurants, homes and galleries all over the world. If you wish for Kate to create a piece of unique art for you to your own requirements or would like to discuss her work any further she would love to hear from you.